#GFF15: Power and performance, love and money. Another dispatch from this year’s Glasgow Film Festival and Blake Backlash looks at three films about women who have to perform. What does it mean to be able to tell your own story? What does it mean to have the power to shape it? 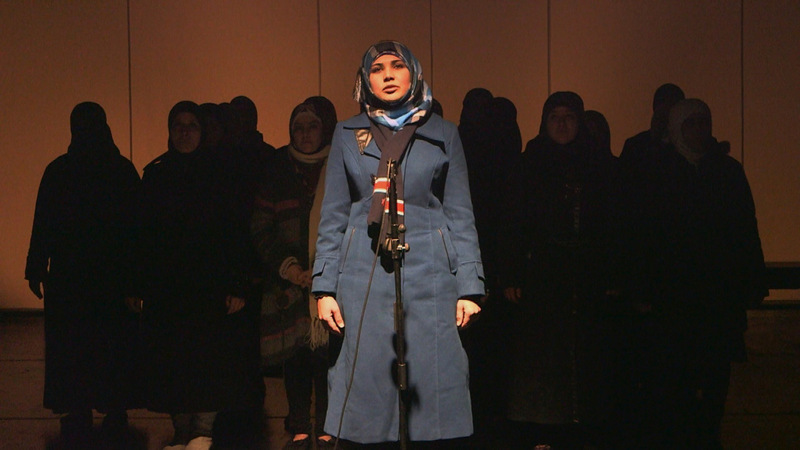 In Queens of Syria a group of Syrian women – refugees in Jordan – talk about why it matters that they are putting on a production of The Trojan Women. They talk about wanting people to hear their stories and about parallels between what happened to them and the story told in the play ‘We were all queens in our own houses. It is like us: We lost everything’. Their production mixes Euripides’ text with their own testimony. The women speak, almost literally, with one voice when they are part of the chorus. And then some of them stand alone in front of a microphone and talk about the loss of homes; brothers and husbands who disappeared and were found dead. Being able to tell your story matters – but Yasmin Fedda’s film explores the ways it can be painful too. We see many faces tense with the effort of holding back tears. Women drop out of the production because of their fears about what might happen to loved ones still in captivity in Syria. Thus the film explores the ways power and testimony are connected. One of the women describes being ordered to sign a statement that states that terrorists killed the people buried in mass grave, when she knows they were killed by soldiers. People in power need her to say she has not seen what she has seen; and does not know what she does know. The film does more than just document the production of the play. It is another place for the women to tell their stories. Fedda’s film sees and hears things the play could not tell us or shows us. We see the women in their homes (which do not feel like homes to them) and we hear their fears and misgivings about being a part of the production. Phoenix is also about conflict, truth and performance. Nina Hoss plays Nelly, who has returned to Berlin at the end of WWII. She has endured time in a concentration camp and has undergone facial reconstruction surgery due to injuries she sustained there. She seeks out Johnny, the husband who may have betrayed her to the Nazis. When she finds him, he cannot see that this is his wife – instead he sees another woman, one who he thinks bears some resemblance to his wife. Johnny reckons with a bit of make-up and some coaching from him, they could fool people into thinking this is Nelly – and so he could get his hands on half of the inheritance due to her. And so Johnny coaches Nelly in how to look and act like the woman that (we know) she actually is (or maybe the woman she once was). He wants her to meet the remains of the group of friends they once had. He knows his audience, accurately predicting how each one will react. And he stages his own ‘reunion’ with her, telling her how to move, how to look at him, like he is most wily and schmaltzy theatre director in Europe. There is even a musical number, Nelly singing Kurt Weill’s ‘Sing Low’ while Johnny plays piano. I found Phoenix engaging all the way through – but for me, it was one of those films that only came into focus in its closing moments. Nelly tries to sing, can hardly sing at first… but then she finds her voice and it makes the air shake, like the beat of a great wing showering everyone watching with ash, Johnny most of all. You’ve probably twigged by now that Phoenix reworks some plot elements and themes from Vertigo. A man is trying to make or remake a woman (who knows more than she’s letting on) into an idealised version of someone she once was (or maybe still is). But where Hitchcock’s film is indulgently romantic, Christian Petzold, who co-wrote and directed Phoenix, keeps one eye on the bottom-line. Post-war Berlin is run down, everyone is broke and it’s money, not love, that draws Johnny towards this woman who looks like the one he once shared his life with. In Queens of Syria the women debate what matters more: love or money. It’s a lighthearted drama exercise, they’re told which side to take then have to switch half-way through their argument. It’s a great scene, funny and true and we see a lot of the women’s characters in the ways they play off one another. They enjoy taking sides, switching sides, laughing as they say stuff like ‘isn’t it better when he can buy you nice clothes, and jewellery?’ But in the discussion afterwards, they talk more seriously – one of the women says: ‘When we were in Syria, it was all about love. Over here, we have nothing, so we have to think about money’. Seeing a lot of films as part of a festival you notice that difference: in some stories people worry about being skint and in others they don’t. In Clouds of Sils Maria they don’t. People talk about life and art and power and gender – and it all takes place in nice hotels, and London clubs. There is always plenty of good food and booze to lubricate the debate the characters are having. This is the film that Kristen Stewart won the Cesar Award for. She’s the first American actress to win the award and she’s very good in this. She plays Valentine, personal assistant to Juliette Binoche’s Maria Enders. Enders is an actress considering returning to the stage in ‘Maloja Snake’ – a play about the tempestuous relationship between a young woman and her older boss. Enders made her name playing the younger woman, now she is being asked to take the part of the boss. Stewart and Binoche perform scenes from the play and argue about them. Stewart acts with a kind of thoughtful naturalism, she has the dry deadpan of youth but also conveys the genuine passions (for art, for movies) that lie beneath that. Binoche is more intense, suddenly laughing or shouting in anger – and you still believe this is a real and charismatic person. Her intensity helps capture the moments that vanity spreads through Maria’s brilliance, like a crack in a mirror. I think the film emphasises the contrast between the approaches of Stewart and Binoche because it is about different styles of acting; about being at different points in your career; about the mutually dependent, sometimes destructive, sometimes invigorating relationship between Hollywood and European arthouse cinema. It is also about women saying lines men have written for them. Both in the sense that the characters are performing lines written by a fictional playwright, Wilhelm Melchior and that Oliver Assayas has written parts for Binoche and Stewart. In that sense the film is both a conversation about and an example of a an idea of European cinema where ‘Great Parts’ are written for women, by men. So it looks back at Ingmar Bergmann’s Persona and Autumn Sonata (which also played in the festival) as well as Rainer Werner Fassbinder’s The Bitter Tears of Petra von Kant (which ‘Maloja Snake’ seems to be based on – although I confess I didn’t clock that when I saw the film). But I think it is also about how these parts are not ‘Great Parts’ until great actresses give them life. About how much of cinema might depends on possibly shonky notions of women, written by men, that become real, grounded and believable when they are performed by actresses who know what they are doing. Which is another reason Kristen Stewart deserved that Cesar. This is the last day of the Glasgow Film Festival. Come back to MostylFilm on Monday for a piece about the Festival as a whole. You should find out more about the Queens of Syria and their version of The Trojan Women here. Love your comments on Kristen Stewart,thank you Blake!